Oh, so it's just sitting on the screen? Have you checked your email? I only got one email, I clicked the button in that email, and this page is what I got from clicking it. How many mails are supposed to arrive? @Ruby Eyes I've temporarily turned off needing email verification. Can you try posting on Discord whenever you have the time? I probably can, at least it doesn't tell me to verify myself first all the time (I have a text input box now), but it still says my username is unclaimed. You know, this is one more example of how useful MEANINGFUL message would be. Something like "permit recaptcha.net" would work. 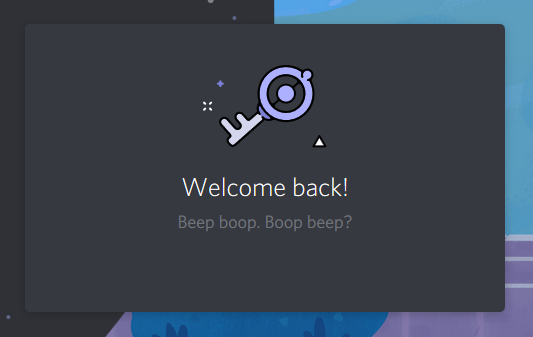 Note that I did make sure that discordapp.com was permitted right after I clicked that invite link - and that was all that was required at that time. I didn't think there'd be MORE later. Thanks for the patience with me!